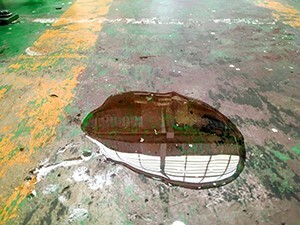 Liquid spills and leaks can occur in a number of places, from under machinery, to the production line, to drum storage areas. Unfortunately, even minor fluid drips can lead to slip and fall accidents. Maintaining a clean facility is an integral part of keeping workers injury-free. Quickly attending to and cleaning up leaks, drips, and spills improve productivity and compliance, while helping to reduce accidents around the workplace. The National Floor Safety Institute (NFSI) reports that over 1 million emergency room visits are caused by slip and fall accidents. These accidents are the leading cause of both overall workers’ compensation claims and also occupational injuries for people aged 55 and older. There are two key elements in choosing the proper spill control materials. The first is toknow what type of liquid you’re containing and cleaning. The type of fluid will determine the type of sorbent material you use. • Universal sorbents are ideal for all-purpose clean-up for oils, coolants, solvents, and water-based fluids. They can be used around machinery, under leaky pipes, and in high traffic areas. • Oil-only sorbents are specifically for soaking up hydraulic oil, motor oil, brake fluid, cooking oil, turpentine, and a variety of other oil-based liquids. They will not absorb water and will float indefinitely. • Chemical or hazardous sorbents are for use when cleaning chemicals like citric acid, hydrofluoric acid, sodium hydroxide, and numerous other chemicals. These sorbents are color-coded for quick identification. Once you determine the type of fluid you’re dealing with, the next step is to choose the right type of sorbent. The capacity of a sorbent is determined by its weight (lightweight, medium weight, or heavyweight), and sorbent type (pad, sock, pillow, etc.). Each sorbent is marked with its capacity. By carefully analyzing your needs before choosing the product for your task, you’ll have a safer, faster clean-up.